There's A Lot Going On Up There!) I had some help finding the location, with assistance from one of the regular contributors on Bigfoot Ballyhoo. I forgot exactly who it was, without going back through all the entries and reading the comments. I was directed to the Squaw Lake, at the south end of Coos County. 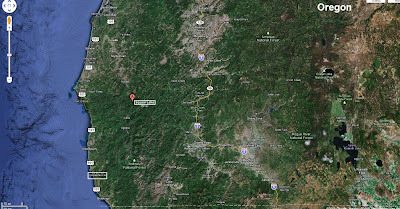 At the time, I found it by typing into Google Maps, and Google Earth, "Squaw Lake, Coos, OR" and "Squaw Lake, Powers, OR." When searching for locations on Google Maps or Earth, if you type in the county name, before the state abbreviation, that helps narrow down the area. I tried Powers, because it was one of the towns near the lake, according to my source. 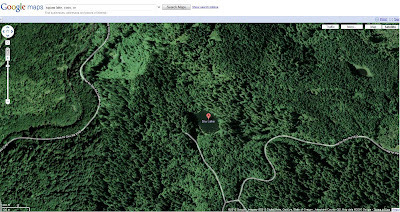 Now, when I enter in "Squaw Lake, Coos, OR" and "Squaw Lake, Powers, OR" into Google Maps and Earth, I am getting the same location, but it now shows the name of the lake, renamed to "Sru Lake." I'm wondering if the name has been changed to keep all the curious folks away, as to not provoke more trouble, or hoaxers? I've seen the active discussion on BigfootForums.com, but I can't seem to get on there to leave comments. Every time I try to sign up for an a user name, it rejects my email saying it is not a valid address. So I post it here, knowing a couple of the Forum readers visit this site from time to time. I hope this clarifies things. It is the location that was passed on to me. sru is pronounced "shrew"..It's the Coquille Indian word for Bigfoot...A little Forest Service joke on us all?? The name was changed for Political Correctness.